With sincerity deeply set inside his eyes, Alex bubbled with excitement as he described God calling him to minister to the internationals our youth group had been serving the past ten days. As we reflected upon our time spent in VBS and building projects, Alex seemed to be only a brief four year stint in college away from becoming a sold out missionary. As we all came down from our spiritual high, Alex took off for college. He never returned to church. Instead of missions, he embraced a life of sexual exploits and familial chaos. Up to this moment, our discussion of salvation, baptism, and parental responsibility has assumed a positive outcome. Namely, all of our discussions assume that our children will get saved. And though salvation is the goal of godly parenting, it’s not the guaranteed outcome. We don’t simply push ABC and get S. Regardless of how hard we try, we cannot manipulate God into saving our children or friends via our good works. God must save. Admittedly, I have only recently been granted full access into the parenting club. I cannot speak to this issue as a parent. Rather, I address the topic as a fellow believer who has been given several opportunities to minister to those who have rejected the gospel for sin. If you are looking for wisdom from those who have ministered to a rebellious child, I highly recommend the book, When Good Kids Make Bad Choices, by Elyse Fitzpatrick and Jim Newheiser. 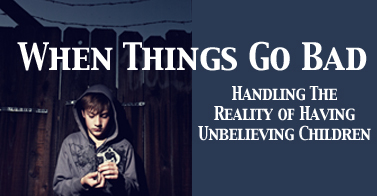 Without further ado, let’s look at how to handle the realities of unbelief. Perhaps the hardest thing for families and friends of unbelievers to do is to admit these lost souls are lost. Perhaps to avoid this heavy burden of misplaced shame or to excuse our need to loving confront sin, many of us walk around saying that the marijuana crazed son, or the daughter with the live-in boyfriend are still good, God loving people. After all, they used to go to church and they did get baptized. We don’t know what happened. Most likely, they are just a little confused. Friends, the Bible does not say these souls are confused. It declares them to be unregenerate; they are lost. The apostle John clearly lets us know that “they went out from us, because they were not of us” (I John 2:19) Our children and friends did not leave the church and embrace sin because they are confused Christians. They had a form of religion for a time. But they left because they never experienced the power of salvation. They may know the Bible but they do not know Christ. The clearest sign of unbelief is open abandonment of the church and the doctrines of grace. The apostle James writes, “Friendship with the world is enmity with God? Therefore whoever wishes to be a friend of the world makes himself an enemy of God (4:4). If your loved one cherishes the sins and philosophies of this world, they are not saved. There is no faith without obedience. If we want to see our children and friends embrace Christ, we must clearly, compassionately, and consistently call them sinners. If we do not call them to repentance, we may avoid conflicts and blunt their rejection. But, we will blind them the hope and mercy of God. Although I know there are many contributing factors to the numbers listed below, I believe Christians who excuse and/or ignore their loved ones sins have unwittingly destroyed the integrity of the Christian faith. Today, 65% of young adults identify themselves Christians. But only 6% of them actually believe in the God of the Bible (Rainer, pp. 232-33). Let’s not excuse a person’s lack of faith and make them a son of hell twice over. Let’s remind our sons, daughters, and friends that they are sinners in need of real, life transformational repentance. I also understand calling your children or friends “sinners” is a heart wrenching task. And watching a loved one reject the faith is discouraging. Yet, we all have hope. Our suffering at the hands of disrespectful teens is not the end of the story. The harsh conversations, the sleepless nights spent questioning our ministry strategies, and the unanswered texts are being used by God to make us into a stronger Christian. I know that no Christian longs for suffering, but the pain caused by our children or friends is for our good. Paul says that “suffering produces endurance, and endurance produces character, and character produces hope, and hope does not put us to shame because God’s love has been poured into our hearts through the Holy Spirit who has been given to us.” (Romans 5:4-5). If our children or friends have or are in the process of walking away from the faith, take heart. Hopefully the situation will be for the benefit of our loved one. God often bring us low so that we can see our need to embrace Christ as savior. Think of the parable of the prodigal son. But the family drama is ultimately for our benefit. We will come out a stronger and more complete believer. And yes, it will be difficult, and yes, you may feel like you’ve been pushed to the breaking point. A few pencils may snap and a cell phone maybe thrown against the couch before it’s all said and done. But we will achieve victory through the power of Christ. You and I will survive this hardship because God does not fail! He upholds us; he is the basis of our hope. God has done all of the hard work. Believe on the Lord Jesus. God the Father will be glorified as you daily become more like Christ. Remember to love. When God saved us, we were his enemies, destined to be judged forever and condemned to hell. We were completely unlovable. Nothing made us seem attractive to God. Truthfully, we really don’t find each other all that attractive. I doubt any of you would sacrifice your son or daughter so that I could life. And I’m not offended. I would never think of letting either of my two sons die to save you. Yet, God in his mercy saved us by covering our sins with the blood of his son. This is a radical life altering love that is so huge that it cannot be grasped by our human minds (Eph. 3:19). Oh what love we have felt! When we feel tempted to write off our children and friends with a puff of self-righteousness, we need to remember how our heavenly Father loved us. Since God loved us while when we despised him, how can we not show this love to our unrepentant children and friends. I know it’s not an easy task. But we can do it. We must do it. As Christians, we are called to forgive as we have been forgiven (Col 3:13). Even though our biblical advice is rejected, we continue to love these lost souls by encouraging them when they excel at work, by supporting them financially when appropriate, and by always being willing to offer them a kind hug or a soft shoulder. Although we should never directly fund a drug addiction or other sinful habits, we must always be seeking ways to love our children and friends. We are to love them with the love with which Christ has loved us. Often when our family devotion fails or our discipleship program has disappointing results, we tend to think God has failed. Nothing is further from the truth. We may have failed if we inaccurately presented the gospel or if we blunted the power of the gospel by living sinful lives. But God is still at work. Salvation via you and me is impossible, but with God nothing is impossible. This is not to say that we have a guarantee that God will save every child raised in the church. People often think Proverbs 22:6 is a promise. The verse reads: “Train up a child in the way he should go; even when he is old he will not depart from it.” Simply teach a kid Jesus and he will get saved. But this cannot be right. If we claim a good discipleship program saves, then we save people through human effort. God said salvation by through human effort was,” impossible” (Mat 19:26). The verse must mean something else. The Proverbs are not promises to be claimed. Rather, they are short statements that reflect general Biblical truth about life. Generally speaking those who have been trained in godliness will not depart the faith. And, we do often see God saved children who have believing parents. However, there are exceptions to these general rules. Think of Jehoshaphat’s family. The ancient King brought revival to his kingdom. But, his son did “What was evil in the sight of the Lord” (2 Chron. 20-21). Not every child who grows up in a Christian home will become a Christian. But with God nothing is impossible. Jesus can and does save the lost and dying. Just think of Paul he was actively arresting and having Christians killed. Yet, God saved him. If God can save Paul, he can most certainly save our children and friends. Even in the darkest of hours, hope in God! Plead with him to save your loved one! Today the youngest Millennials are finishing junior high. The window of opportunity to reach this generation through family worship is on the verge of disappearing. But the ability of parents to evangelize and disciple this generation is not coming to an end. Almost 90% of America’s largest generation looks to their parents for guidance and advice (Rainer, p. 55). And 88% of these young adults think their parents are a positive influence (Rainer, p. 245). In other words, adult children value parental guidance. Parents, reaching the next generation for Christ is only a cellphone call, a Skype conversation, or Facebook message away. As we wrap up the Baptism Class For Parents, I want to return to where I began. Parents, God has given us an unprecedented ability to reach our kids. Whether your child is a wiggly infant or sitting calmly in a cubicle, God wants you to reach them for Christ. Admittedly how we go about reaching our kids depends a great deal on their age and the nature of their heart. But the fundamental principles that underlie our interactions with the next generation remain the same. We pursue Christ with our heart, soul, and mind. Then we share our passion for God with our children via prayer time at the dining room table or a quick text message (Duet. 6:4-9). Certainly, we will make mistakes, misdiagnose our child’s heart, and will struggle at times. But ultimately the salvation of our children doesn’t begin or end with us. God saves. Regardless of where we and our children are, nothing is impossible with God! Rainer, T. S. (211). The Millennials: Connecting To America’s Largest Generation . Nashville: B&H Publishing Group .